Have you ever been curious if someone else is logging into your social media accounts? If you were hacked? How did they gain access? When did it happen? Twitter improves their security with this new feature. 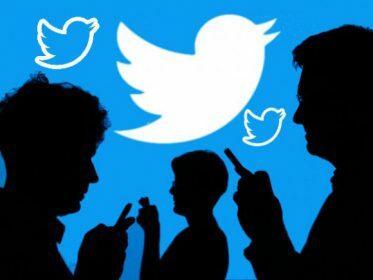 Twitter joins Google and Facebook to allows you to see all devices that signed into your account. This new security feature gives users insight into who is accessing their accounts, including location details. This can also be viewed on a desktop or laptop. 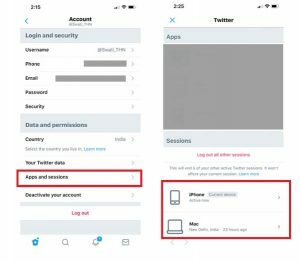 The ‘Apps and sessions’ tab allows users to view all devices active on your Twitter account in the last month, including location details and third-party apps that have access to your Twitter account. Click on the devices to view more information. 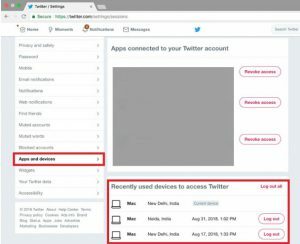 This will show the name of the device that accessed your account as well as what browser, the date and time, and the location of the device that was used. If any suspicious activity is found, a user can remotely revoke access with just one click. This will terminate the session on whatever device was logged on. It is recommended to change your password when you notice such activity to prevent unknown users to continue accessing your account. It is also in that users’ best interest to change accounts that have the same email and password combination to avoid future exposure. Update recovery and enable 2-step verification in your settings to further defend your account.